This was money well spent. Professional, efficient, no nasty chemical smells, made sure my pets didn’t get lost too. I called Mass Carpet Cleaning due to a nasty dog accident today. Yeah, one of those “accidents” you CAN NOT clean on your own! Mass was here in 20 minutes of me calling for HELP! Plus, they were out with in about 35 minutes! I received a VERY reasonable deal for 2 rooms and my hallways. I’m impressed with their time of arrival, their professionalism and whatever they used to clean and treat my dog stained carpets! Dogs and cats don’t sweat like we do. It comes out in their urine which adds a high salt content. Urine starts out sterile on the acidic side and changes to an alkaline, which means old urine is different than fresh urine. Urine does not dry because the alkaline salts attract moisture and breed bacteria which continuously create odor. Urine can bleach out and permanently stain carpets. We use a 3-step process which safely kills the germs and bacteria that cause the odor. This process is safe for pets and gives the best odor removal results. Our technicians carry moisture sensors which can locate unseen pet odor sources for best treatment results. For severe cases of urine our technicians are equipped to replace the pad under the affected areas of your carpet and treat the floor as well as the carpet if necessary. 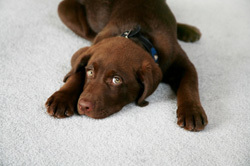 Please note that urine can leave permanent stains, discoloration and even bleach the color out of carpets. If we can’t get the stain out, no one can. In such cases we can often patch the area with a piece of carpet from a remnant or from an inconspicuous area like a closet.